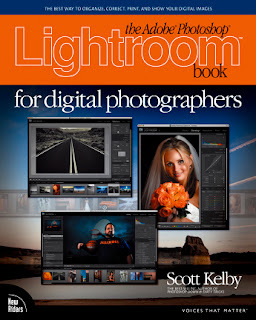 Now that Adobe has officially announced Lightroom Verison 1.0 (see the next post down), I’ve just finished wrapping up my new book, “The Lightroom Book for Digital Photographers“, which has the exact same layout and style as my “Photoshop CS2 Book for Digital Photographers,” where it takes you through the whole process step-by-step, from importing, thru sorting, developing your raw, JPEG, and TIFF images, all the way through printing the final image (and there’s an entire section just on using Lightroom with Photoshop; where Photoshop fits it, and when and where to use it). NOTE: If you purchased the pre-release eBook version of this book (the online downloadable PDF version, based on the public Beta release of Lightroom), you’ll be happy to know that I basically rewrote the entire book from scratch for this final print edition, with all new content, photos, new chapters. What I’m most excited about are the last two chapters, which I added for the print version, which take you step-by-step through two real working photography projects; a wedding shoot (where we start with a live bridal portrait shot on location at the church) and it takes you through the entire process, including importing, sorting, the inital client presentation in your studio, having the client proof shots online, all the way to actually printing the final 16×20 formal print for framing. The second chapter follows a different step-by-step workflow, from the live shoot to print, of a outdoor/landscape photo shoot. This two chapters pull it all together in a way I’ve never seen illustrated like this before,and I can’t wait to share it with you. And be the very first to get this new book, from Amazon.com, Barnes & Noble.com, or wherever books are sold. Also, I’m doing something completely different next week, as I’m teaching a two-day hands-on Lightroom Workshop at the Digital Technology Centre in Sarasota, Flordia, and if you want to learn the future of the professional digital photography workflow, I hope you’ll join me (the class is limited to 20 people, and there are just a few seats left). You can find out more, and reserve your spot by CLICKING HERE. I hope to see you there! (By the way, if you sign-up for my workshop, make sure you bring your camera, because this is totally hands-on, and we’ll be doing the whole process live, from capture to output). Next PostHow Does He Do It? In Camera or In Photoshop? Wow! It’s really a nice blog. I hope people will be benefited as like me. Thank’s for share .